San Francisco RainGlobe - The Globe That Rains! The newest in the RainGlobe family, it's San Francisco! The Golden Gate Bridge, Coit Tower, Lombard Street, the Transamerica Pyramid, Chinatown's Gateway Arch (Dragon Gate), some colorful row houses, and a trolley on top. Grab your umbrella and order now! 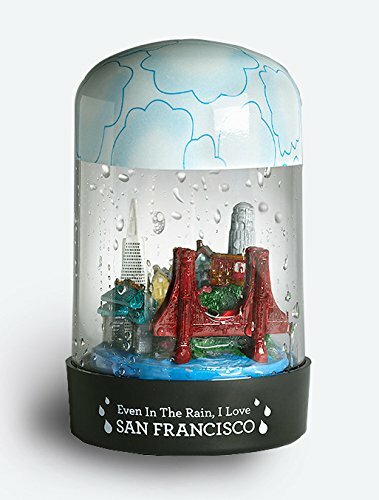 Inspired by the snow globe, this San Francisco RainGlobe is the globe that rains! Unique, fun gift that will wow your friends! Has all the beauty of the San Francisco: The Golden Gate Bridge, Coit Tower, Lombard Street, the Transamerica Pyramid, and more! If you have any questions about this product by RainGlobes, contact us by completing and submitting the form below. If you are looking for a specif part number, please include it with your message.